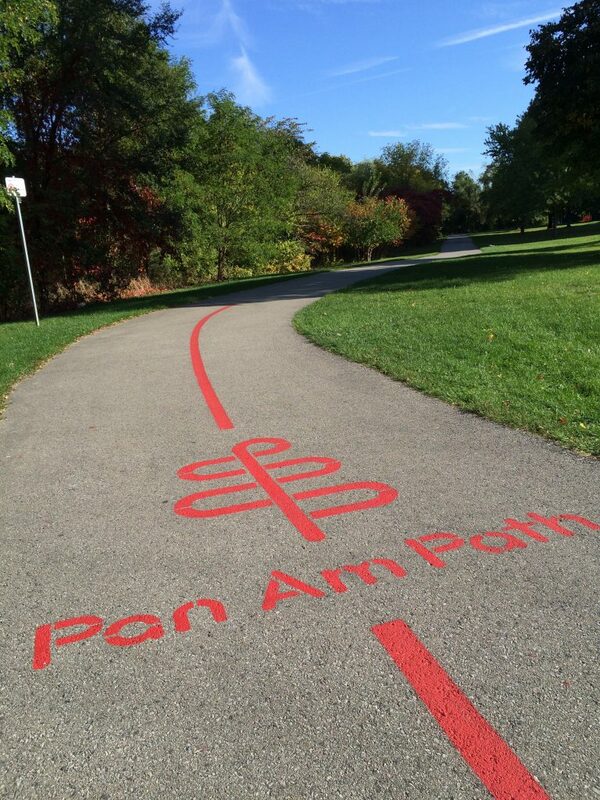 In 2015, Toronto hosted the Pan Am Games and unveiled the Pan Am Path! 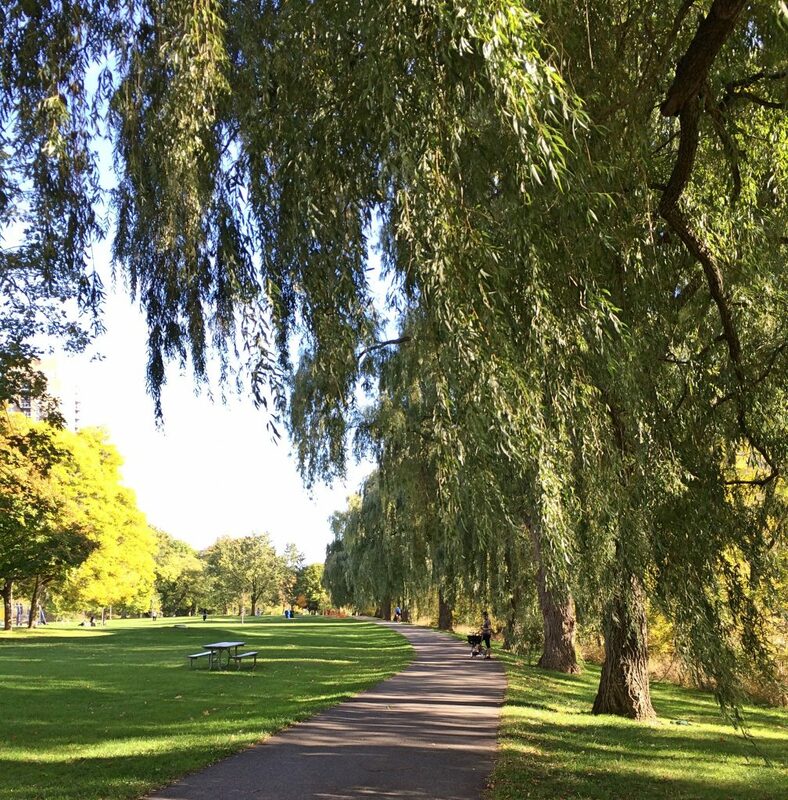 This multi-use trail runs from the most north-easterly point of the city (Claireville Dam where Toronto borders the city of Brampton), south to the lakeshore, and all the way east to Rouge Park where Toronto borders the city of Pickering. 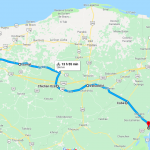 That’s 85 kilometres! 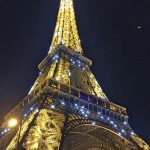 Sections of this route already existed, but the city connected the separate trails to create one big mega-trail across our huge megacity. 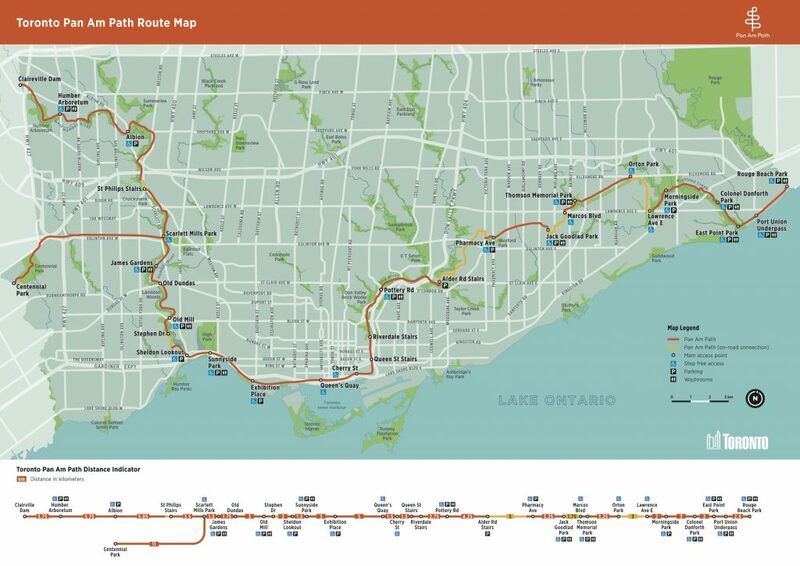 As you can see on the map, the trail still has some blank spots, labelled “on-road connections”, but it’s a big improvement from what it was before. First things first, we decided this was not going to be a round trip, so we needed to get to the Pan Am Path’s starting point all the way up at the north-west border of Toronto. 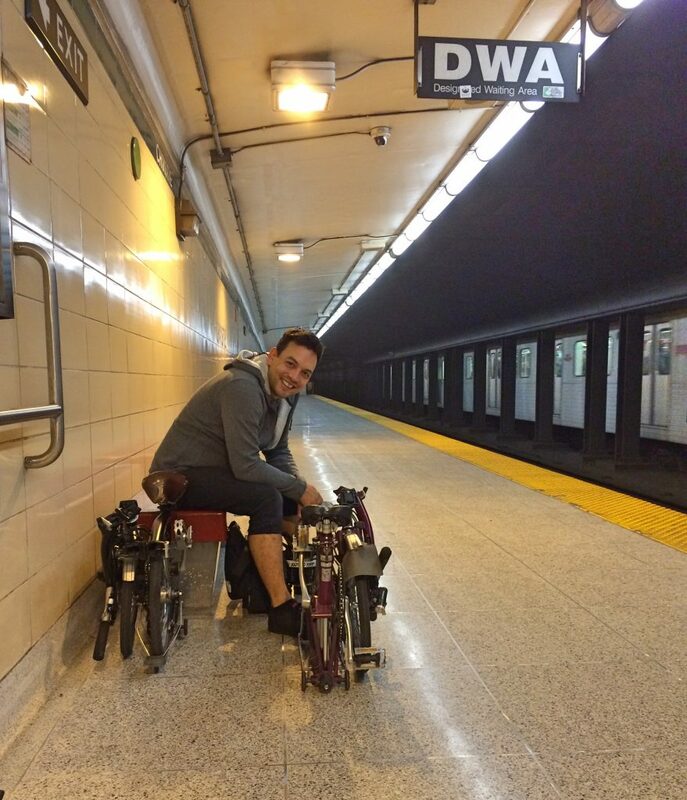 Neither of us take transit very much (why would we when we have bikes? ), but Google maps came through for us. The recommended transit route: take the Line 2 subway all the way west to Kipling station, then catch the 927B Highway 27 Express bus to Humber College’s north campus. 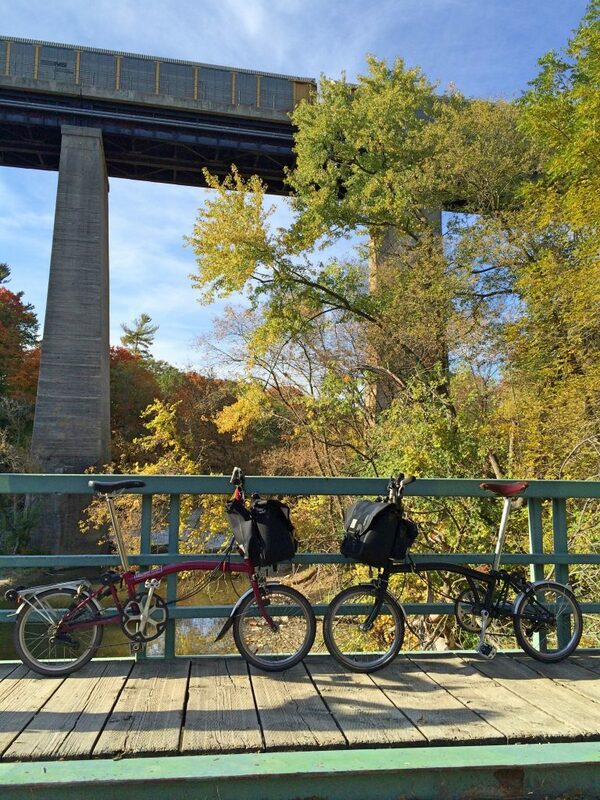 … to the beginning of the Pan Am Path at the Claireville Dam. 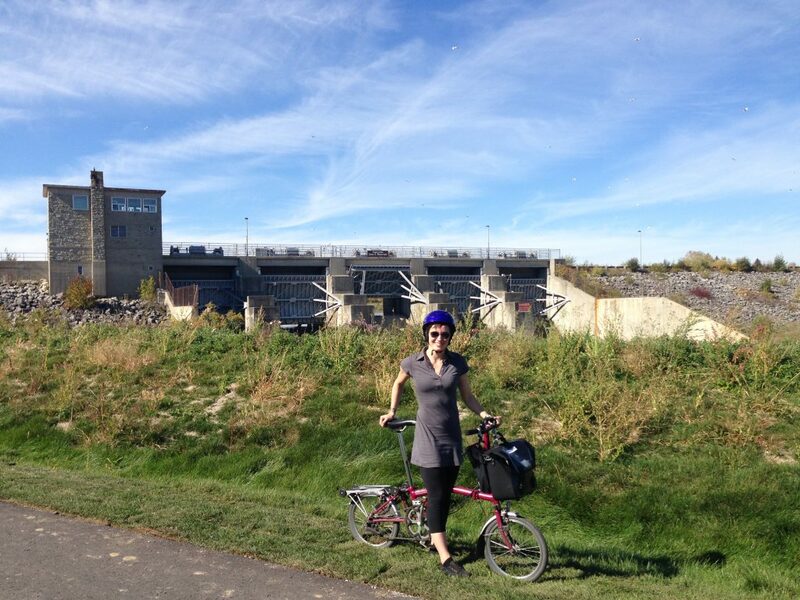 Heather and the Claireville Dam. 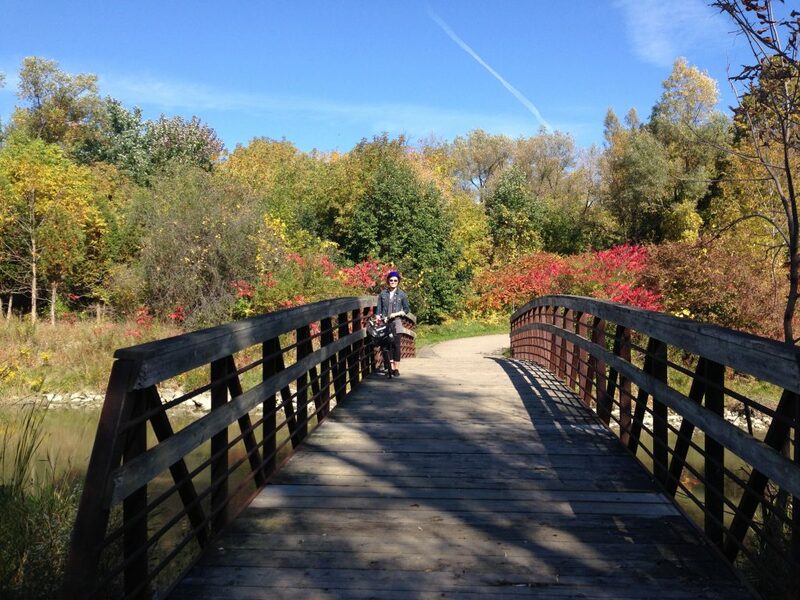 Pier and Bromptons on serene Pan Am Path in the Humber Arboretum area. 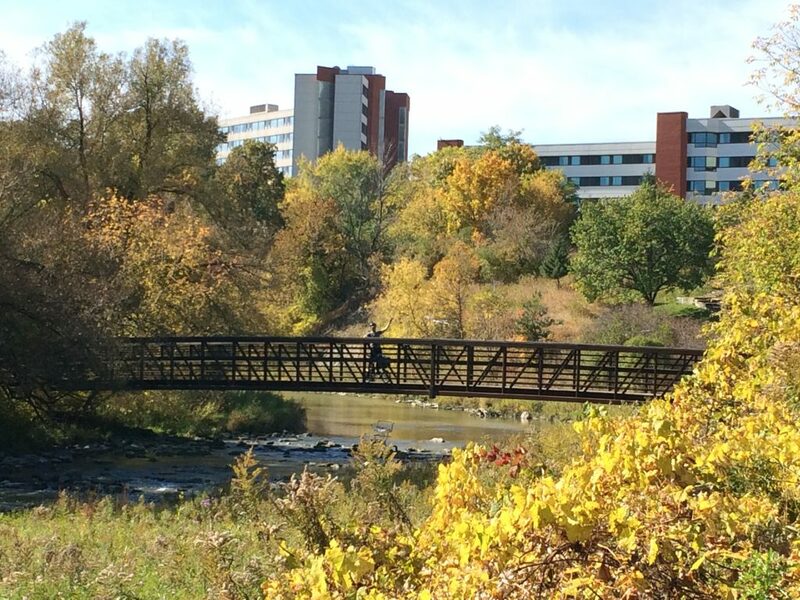 Pedestrian bridge over the Humber River, Toronto. 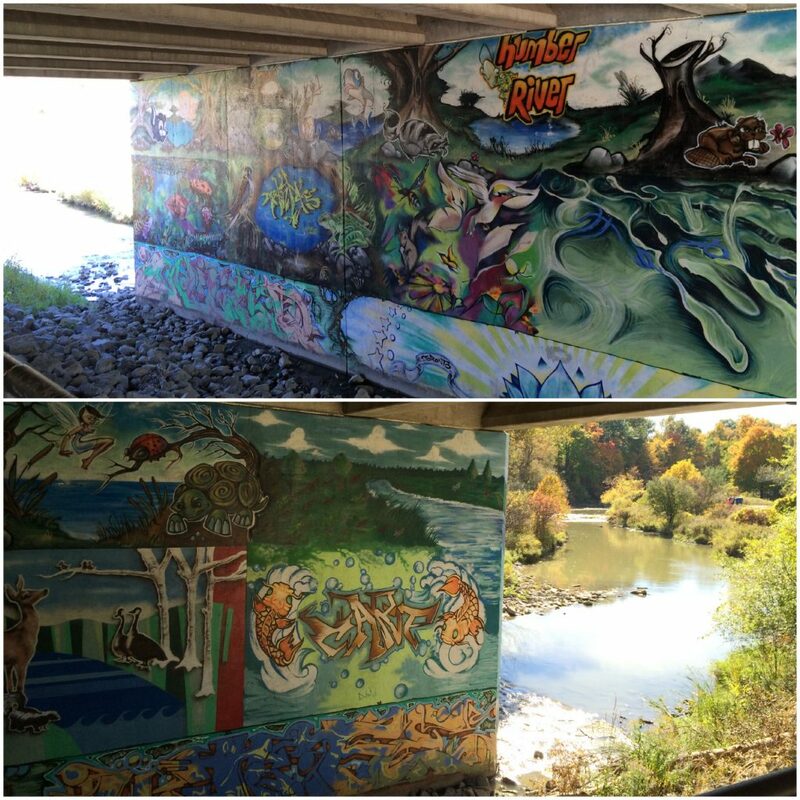 Underpass Art, Humber River, Toronto. 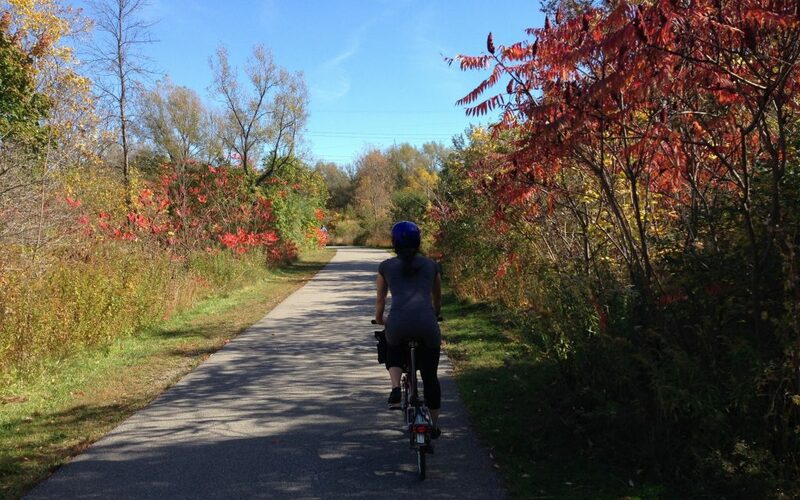 Heather cycling through the fall colours. There are plenty of signs marking the trail. And also workout apparatuses spaced along the trail. This section also crosses the hydro corridor. Look closely in the bottom left corner and you can see Pier waving before he crosses the bridge. Pan Am Path bridge in hydro corridor. And then we arrive at the 401 underpass! Pier under the 401 Expressway, Toronto. 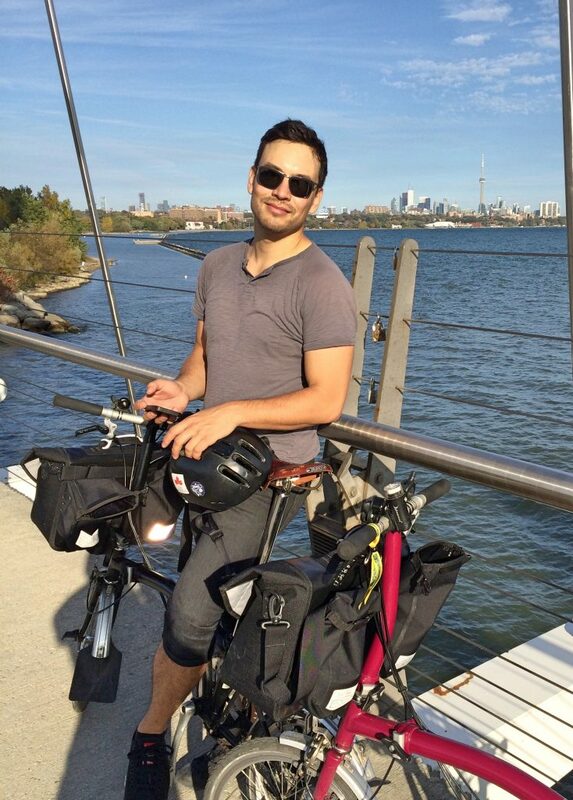 This is probably the most necessary infrastructure when cycling in the north end of Toronto. Up here the streets driving over this behemoth of a highway are also big and fast, so cyclists need their own separated path to safely cross the 401 divide. 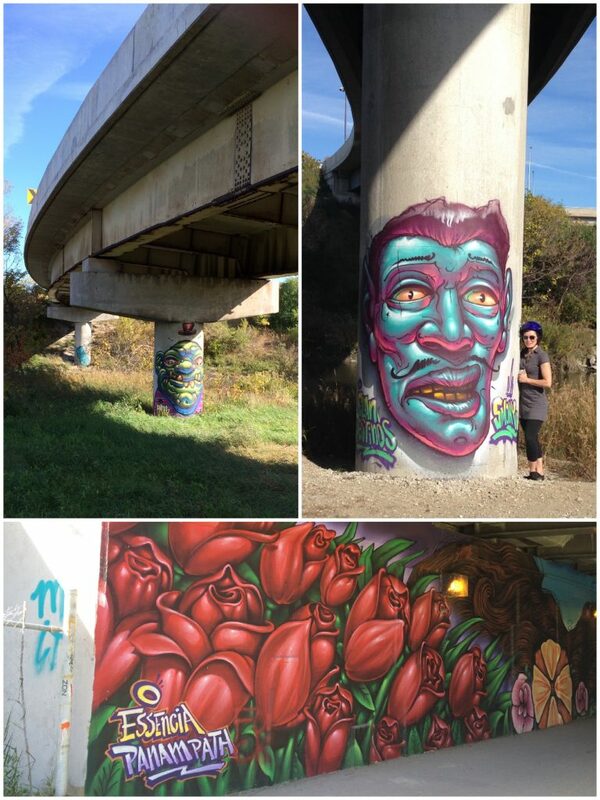 And to make the under-the-highway area a little more inviting, graffiti art was commissioned here too. 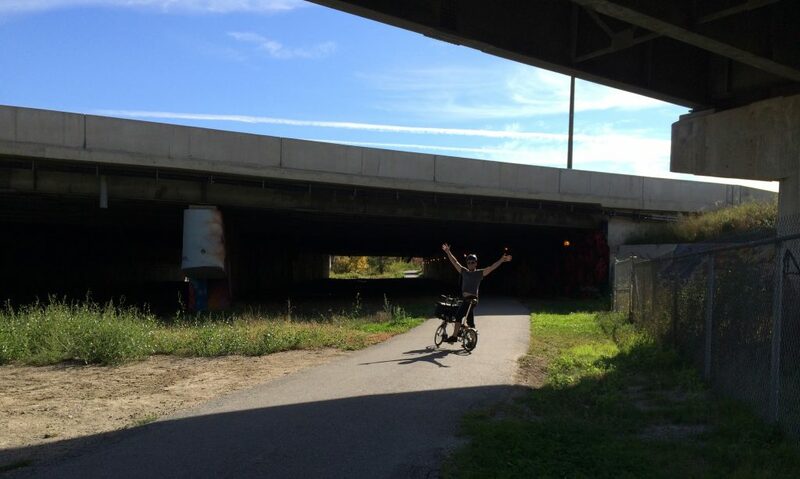 Shortly after cycling under the 401, the trail dumps you onto a residential side street (Cardell Ave), which leads to Weston Rd. You need to cycle on Weston Rd for a couple blocks (follow the sharrow bike markings in the right hand lane), and just after you pass under the rail bridge, the road forks—Weston Rd goes left and St Phillips Rd goes right. Go right and you’ll see the trail right there. Pan Am Path continues off St Phillips Rd. We took the left trail to the stairs (the right trail probably avoids the stairs). The St Phillips Stairs on the Pan Am Path. 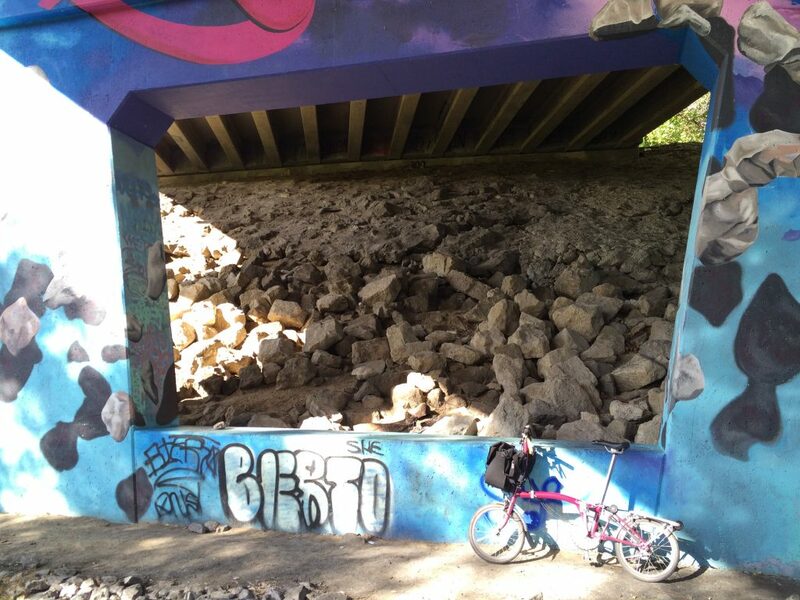 A couple minutes later we were biking under St Phillips Rd with this amazing graffiti art! 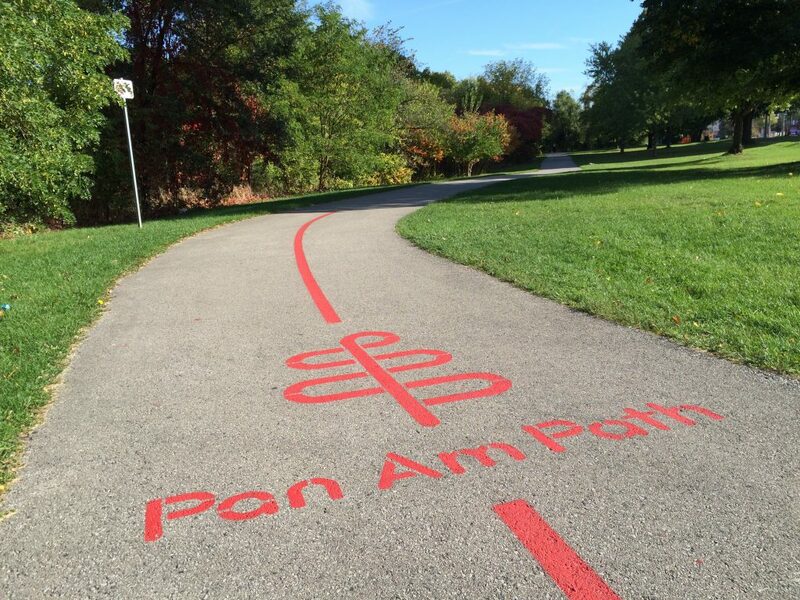 This was part of the Pan Am Path Art Relay, a games-inspired art project. 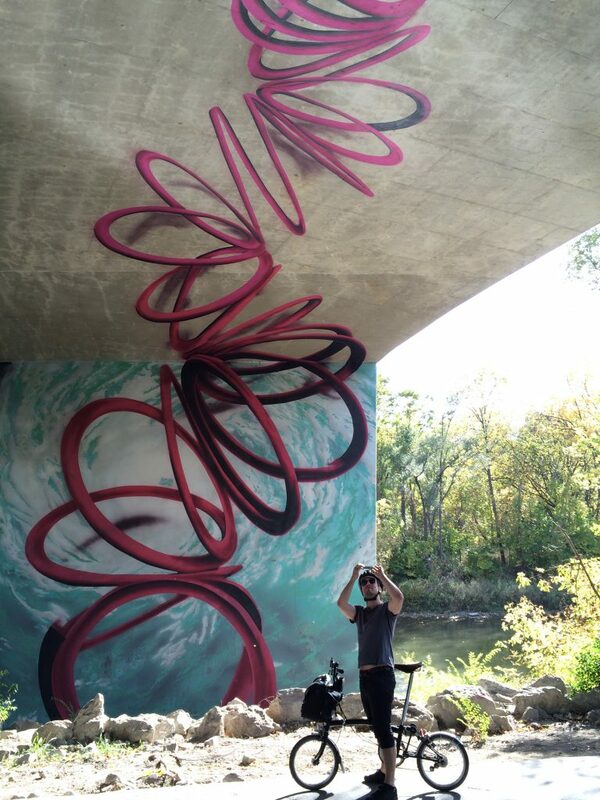 This particular piece is a collaboration between UrbanArts and artist Dan Bergeron. 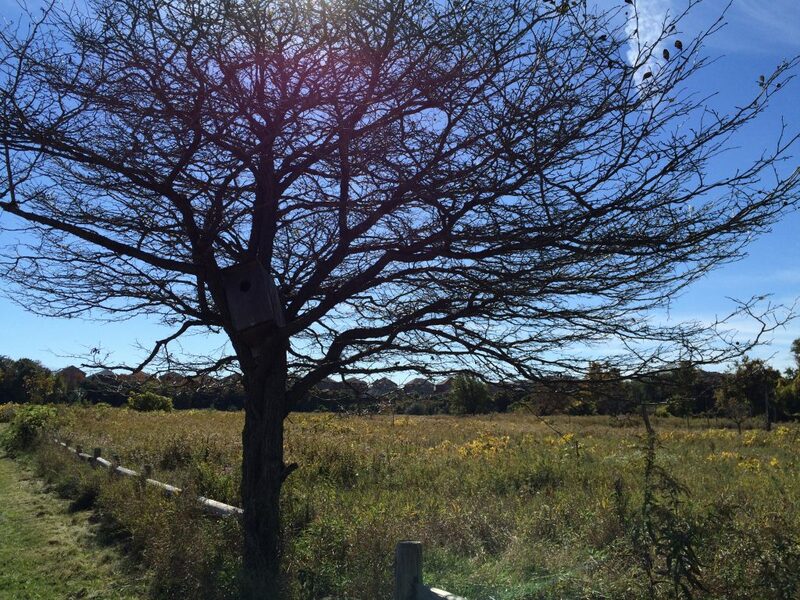 It explores the legacy of Hurricane Hazel which hit Toronto in 1954. Graffiti art under St Phillips bridge in Weston. 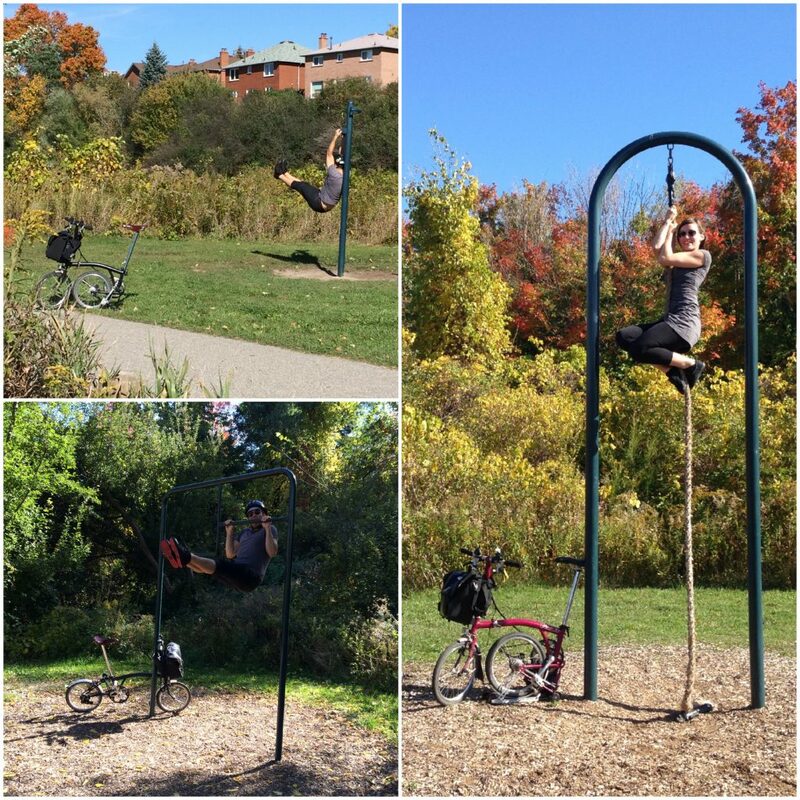 Shortly after, we rolled into Cruickshank Park. 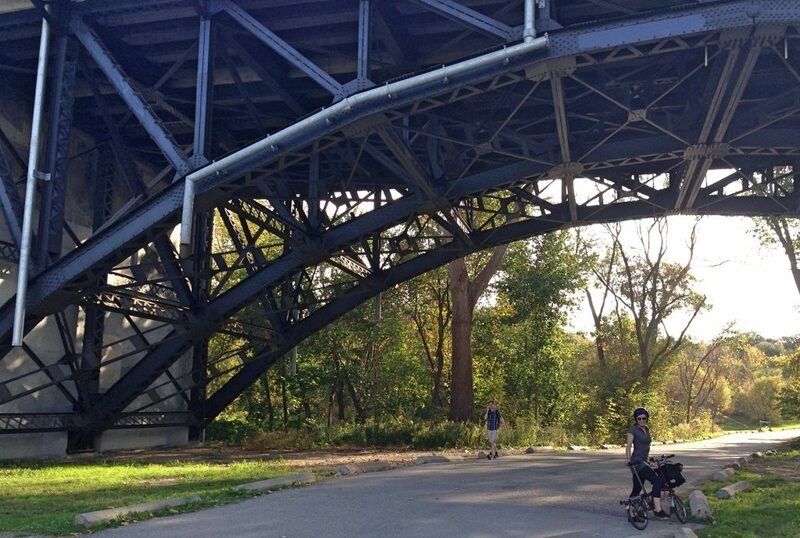 After Cruickshank Park, the path continues under Lawrence Ave and through Weston Lions Park to an old rail bridge crossing over the Humber River. 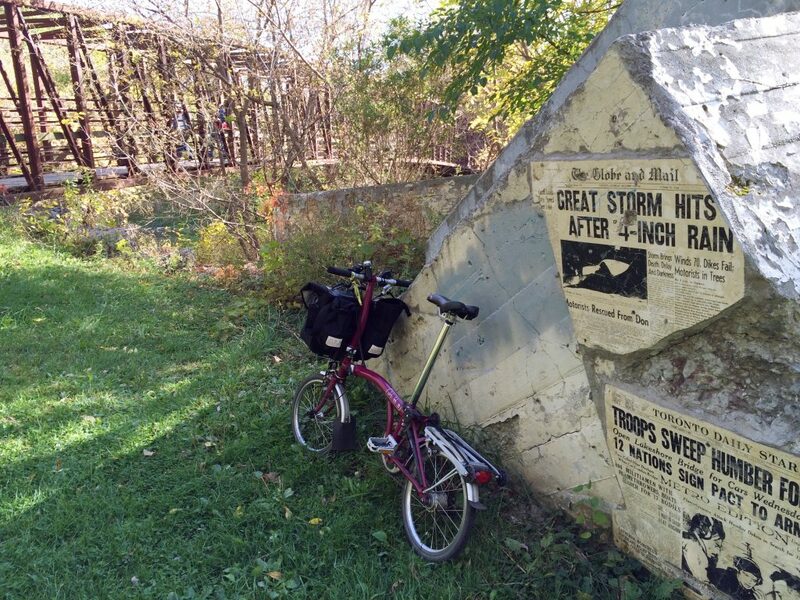 Here we found a memorial to Hurricane Hazel that flooded the Humber River right over this bank and bridge in 1954. Hurricane Hazel flood line marking stone and memorial. 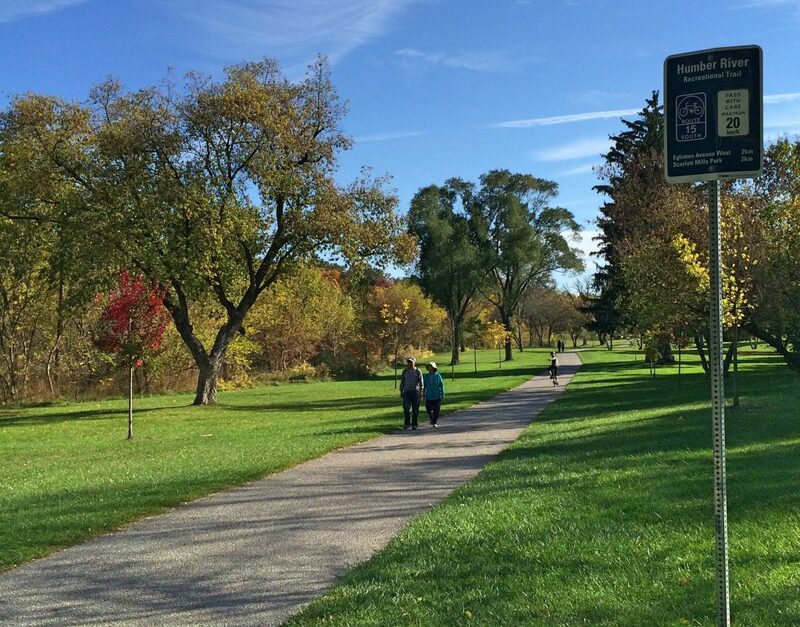 Then the trail continues to Eglinton Ave.
Humber River Trail sign – 2km to Eglinton Ave! In case you weren’t sure you were on the Pan Am Path. There’s a slight uphill into James Gardens, but that’s no problem, especially since it’s been downhill this whole time. And of course, what goes up must come down. 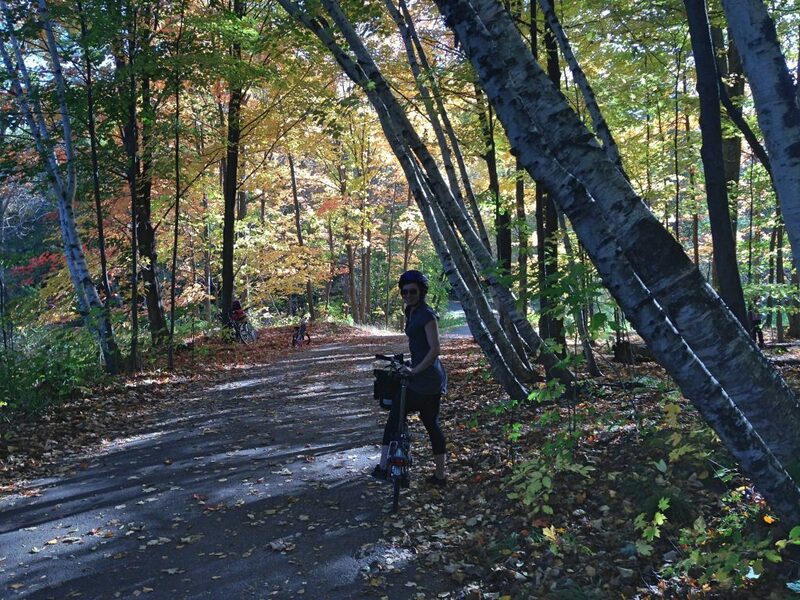 Pretty fall leaves along the James Gardens section of the Pan Am Path. Bromptons on pedestrian bridge below train bridge just north of Dundas St W.
And we arrive at the Dundas Street West bridge where we find more Pan Am Path Art. 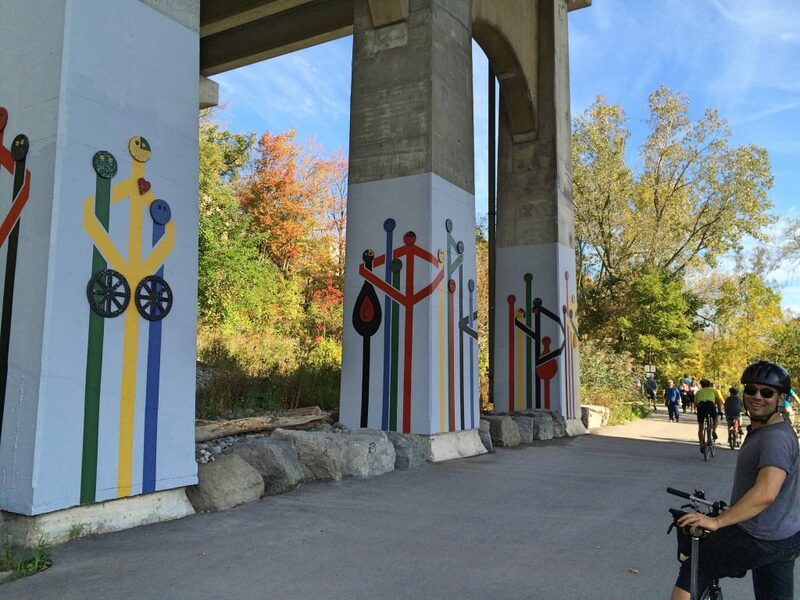 More Pan Am Path Art under the Dundas Street West bridge. 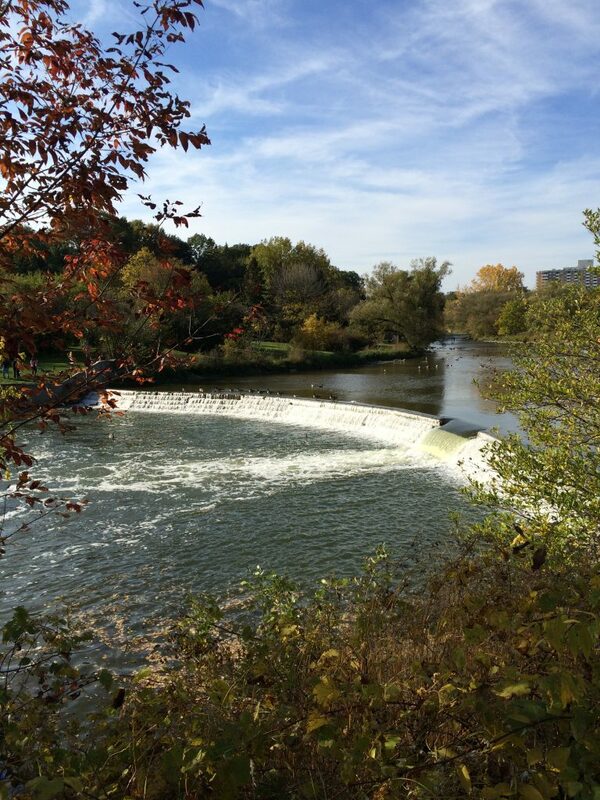 And pretty shots of dams on the Humber River. 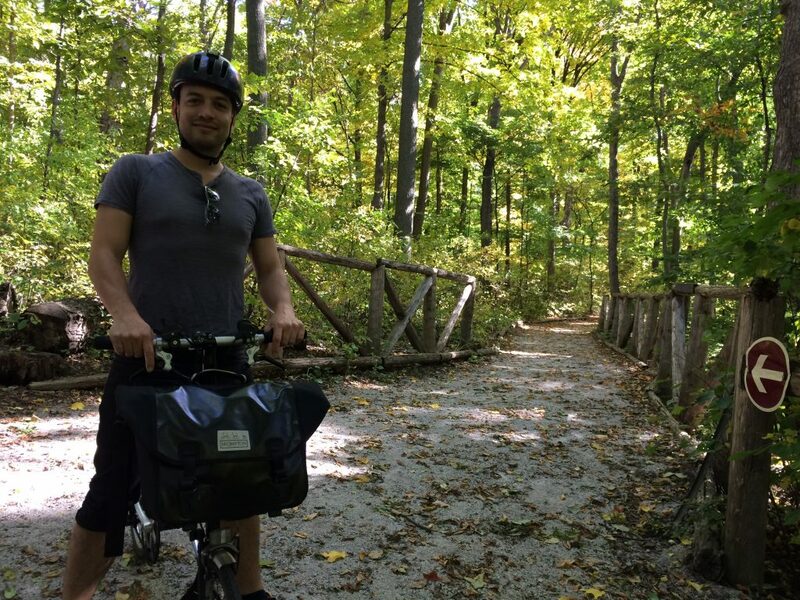 When we started our ride, we saw hardly anyone on the trail. Once we crossed Eglinton Ave we saw more people, but still not crowds. However, the farther south we got, the more crowded the Pan Am Path become, and by the time we got to the Old Mill area, the trail was quite busy. 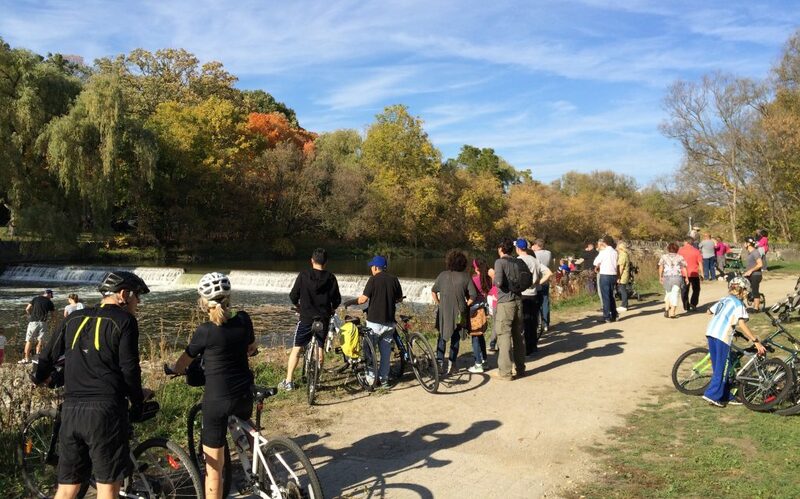 People stopping to watch the birds and fish in the Humber River. 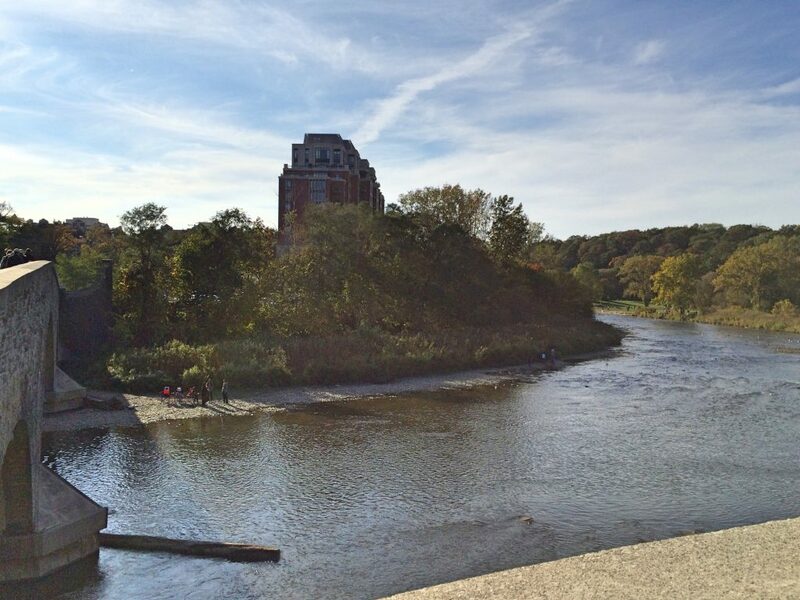 View of the Humber River and Old Mill Inn from the Old Mill Bridge. Pan Am Path under Bloor St West bridge. 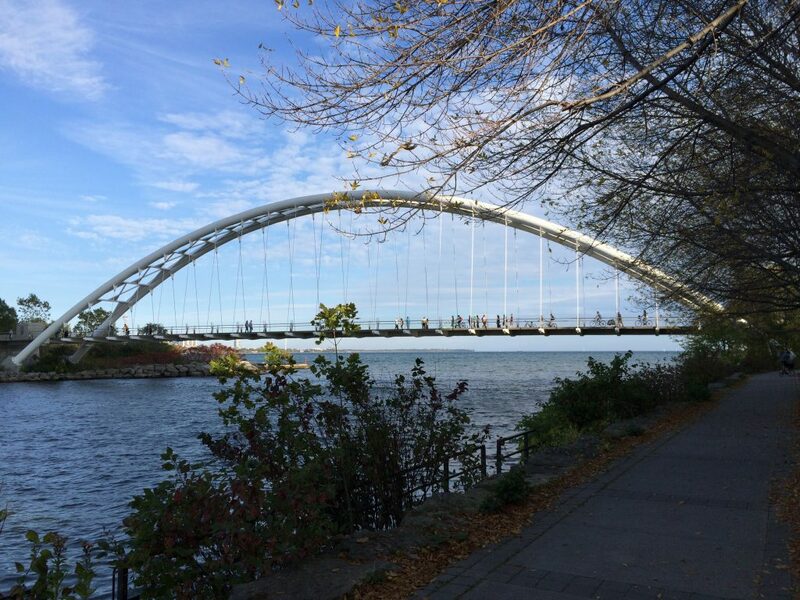 Finally, we arrive at the iconic Humber Bay Arch Bridge! Pier relaxing on the Humber Bridge with downtown Toronto in the background. By this time we are super hungry, so we book it back along the Martin Goodman Trail section of the Pan Am Path and stop at our favourite Polish restaurant, Cafe Polonez, for some yummy eats. 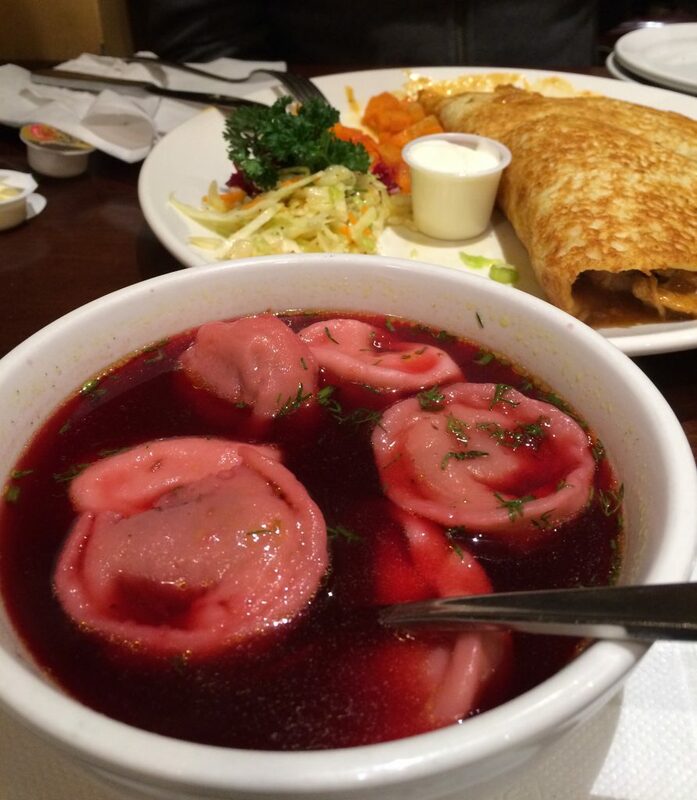 Dinner is a Hungarian Pancake and Beet Root Soup with Dumplings! 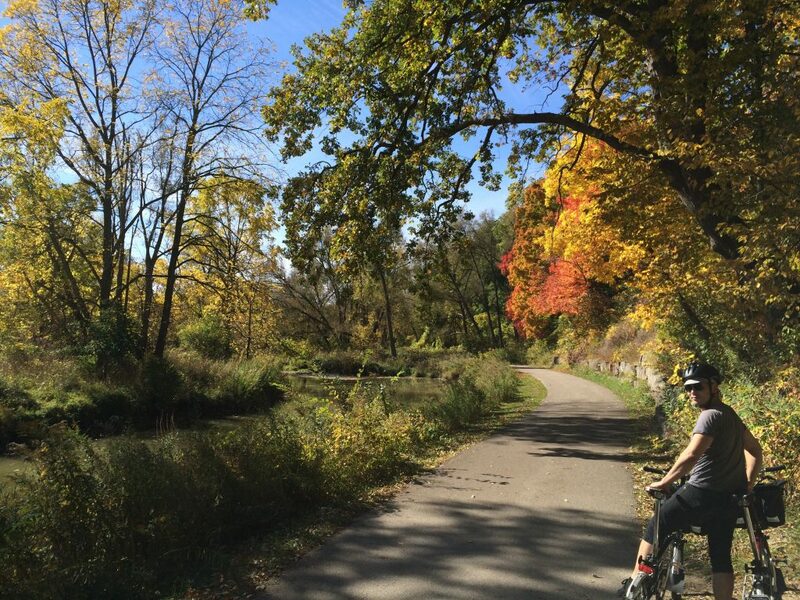 In conclusion, we highly recommend this ride! 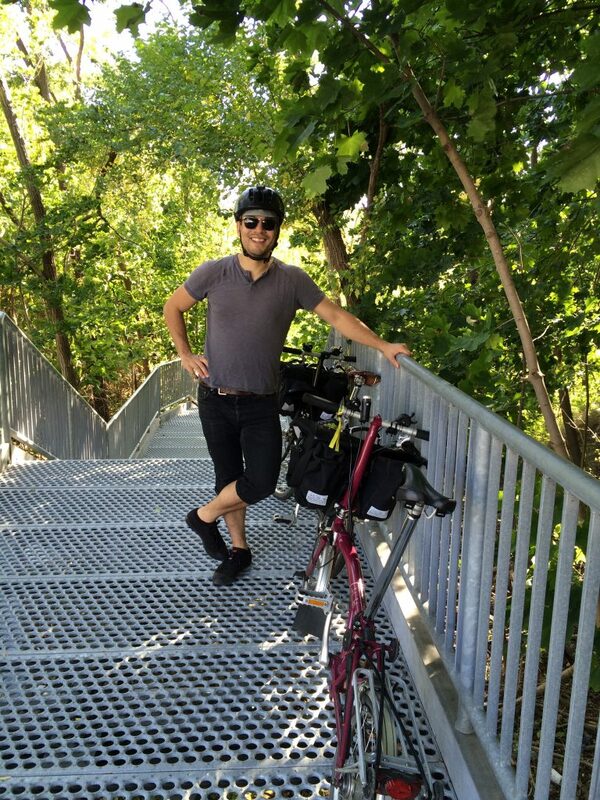 It’s full of beautiful scenery, fun art, great places to picnic, and best of all, it’s neat to cycle through the different areas of Toronto because the city changes so much from north to south. 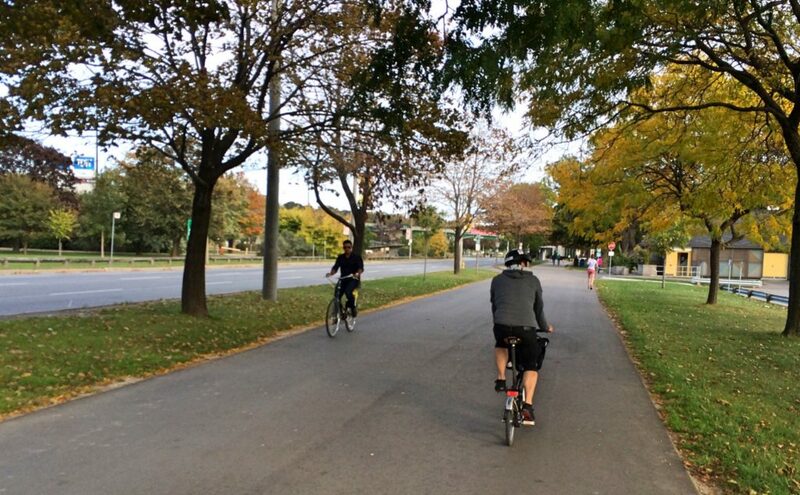 Next year, we’ll have to do the east side of the Pan Am Path! 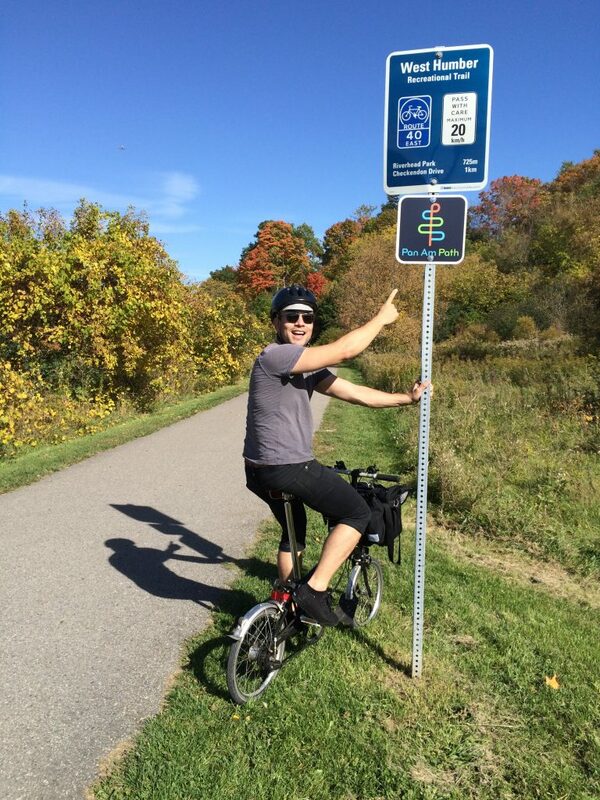 Gonna do this…years since we rode the Humber Trail. Looks much better now. Thanks so much for this! Whoops! We always get the Hungarian Pancakes and I was thinking of their deliciousness as I was typing. I’ll go correct the error now; thanks for pointing it out! 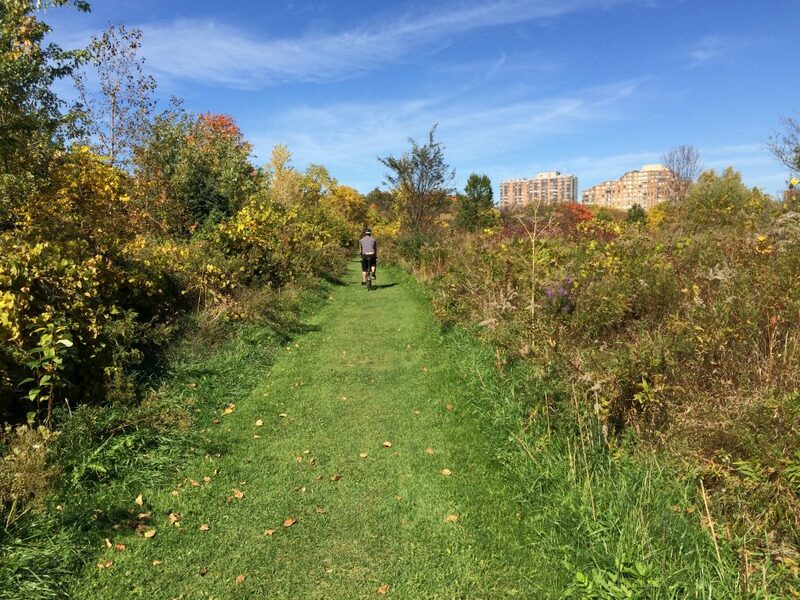 And yes, the Humber Trail is much improved. 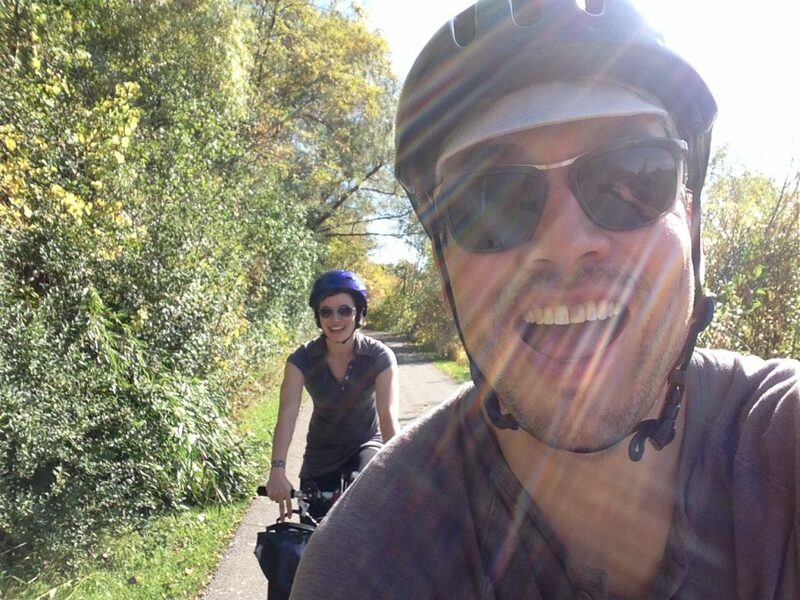 Have fun cycling it again!